MUSICPEOPLE is back this week with two very special musical friends, both with a long track record in making Bangkok parrty folks dance, smile & leave their worries behind for a few precious hours. Ben Goldman, our man from Chicago (Illinois) has been roaming BKK’s club life for many years now, since leaving the life of a DJ & label manager in his home town behind. His authentic jackin’ Chicago sound is something not heard too often around Bangkok, so come and check out how Chi-Town rolls. r (Pittsburgh, Pennsylvania) , the towering mover & shaker from the DUCK & NOODLE crew (when he isn’t planning the next big underground happening) has been quietly honing is electronic live performance skills. Until he’s completely satisfied & ready to press his analog >PLAY button, we have the honour of being treated to one of his deep & quirky DJ sets. 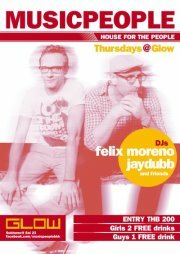 Both US imports will be musically accompanied, supervised & cheered upon by our bi-partisan MUSICPEOPLE residents MORENO & DUBB. Bring on the collateral damage, we say!